The Russian people deserve a government that supports an open marketplace of ideas, transparent and accountable governance, equal treatment under the law and the ability to exercise their rights without fear of retribution. People gather on Tverskaya street during an unauthorized opposition rally in Moscow on June 12, 2017. Washington, United States: The White House strongly condemned the arrest of hundreds of anti-corruption protesters in Russia on Monday, in a rare criticism of human rights violations and the Kremlin from Donald Trump's administration. White House spokesman Sean Spicer called on Moscow to "immediately release all peaceful protesters" detained in nationwide marches. "The Russian people deserve a government that supports an open marketplace of ideas, transparent and accountable governance, equal treatment under the law and the ability to exercise their rights without fear of retribution," Spicer added. 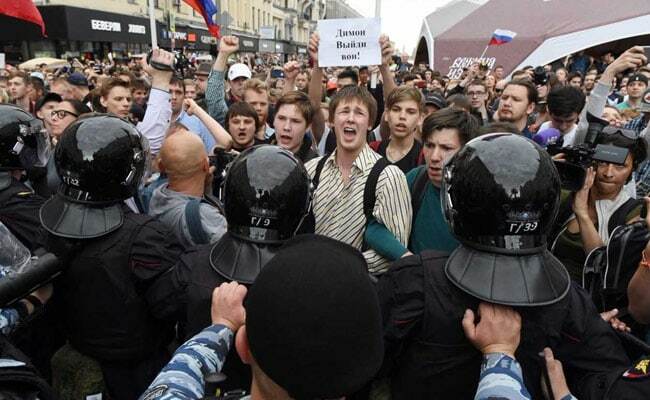 Authorities detained Russian opposition politician Alexei Navalny and nearly 1,000 of his supporters Monday, as they mounted demonstrations across the nation against government corruption. The White House called the detention of human rights observers and journalists an affront to "core democratic values," and said it would continue to monitor the situation. Trump's White House has often refrained from commenting on human rights abuses overseas, and has frequently praises Vladimir Putin's regime. Former administration officials have warned that stance risks emboldening authoritarian regimes, who, sensing no pressure from the United States, feel more room to launch crackdowns.